att skicka SDI signalen vidare upp till 300m medans du samtidigt kan plocka ut HDMI signaler till en skärm. 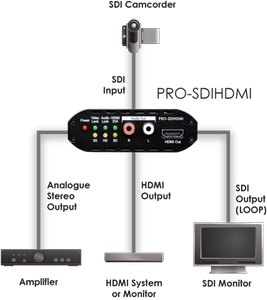 The PRO-SDIHDMI Converter accepts SD-SDI, HD-SDI, and 3G-SDI signals and converts to HDMI. 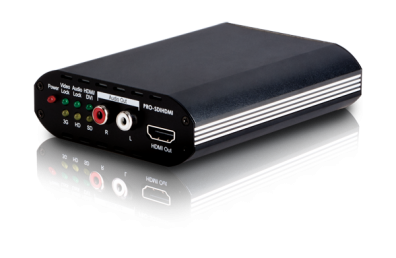 The SDI input also has a bypass which is outputted simultaneously alongside the HDMI output allowing the SDI signal to be extended over distances up to 300m. This device also has the added benefit of an integrated audio de-embedder for sending 2-channel (L/R) audio to an AV amplifier.